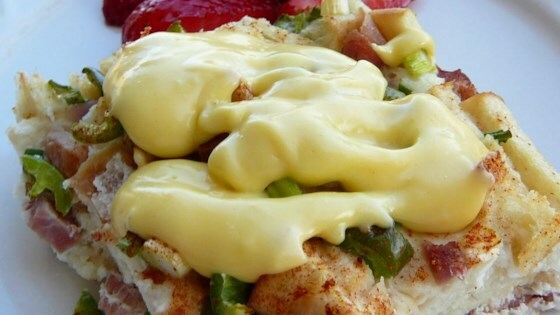 "Quick and easy hollandaise sauce. Makes enough for 2 servings of eggs benedict or asparagus. I've tried several ways to make hollandaise sauce; this method works every time and is very quick. My kids love it. I put poached egg on toast or biscuit and top with sauce. I also add crumbled sausage with jalapeno and garlic." Beat egg yolks, lemon juice, salt, and cayenne pepper together in a microwave-safe bowl until smooth. Slowly stream melted butter into the egg yolk mixture while whisking to incorporate. Learn the simple tricks to perfect hollandaise sauce. If sauce separates after microwaving, add a splash of water and whisk until combined. Should have read all of the reviews to make a thicker tastier sauce for Eggs Benedict. Hubby was happy. Me, not so much. I would say it needs a little longer in the microwave too depending on how hot the butter is being drizzled in. I like the 10 sec increments.